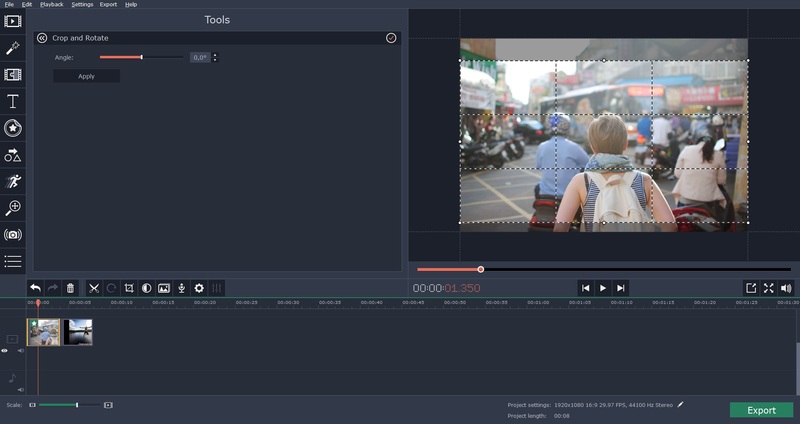 Have you just launched a video editor for the first time and found yourself face to face with a screen full of tools? It is easy to feel lost when that happens, and odds are you may not know or recognize most of the tools that are laid out in front of you. The split tool will let you split a video clip into segments, and you can use it to isolate and remove parts that you don’t want – or merge separate clips together at a specific point. It is the cornerstone of video editing, and is used extensively to cut together videos. Some video editors may have a trim tool instead of a split tool – and it works similarly. Essentially it will trim out all the parts outside of the selected area. The crop tool will remove a section of your video adjacent to the frame. Because it will alter the frame in the process, it can be an extremely powerful tool that you may use to adjust the video’s aspect ratio or even improve its composition. If you want to improve the video composition, you should use the crop tool alongside a composition technique such as the rule of thirds. In some editors the crop tool will already have gridlines that will make using the rule of thirds easier – but in others you will have to enable them separately. In the majority of editors there should be an automated tool to help improve the white balance. Essentially this tool will attempt to calculate the white balance for the video to make its color look more natural and closer to real life. Considering it is automated, applying the white balance tool is really simple yet it can have a big impact on how your video turns out. In some cases when the white balance is really bad the video will be a shade of blue or orange, and correcting the white balance can make its colors look much better. All said and done the most effective way to learn to edit videos is to start using the tools in your video editor and seeing what they can do. The list above should be a good place to start, and as you become more familiar with those tools and your video editor in general – you can start to experiment with other tools as well.